How do sleeper trains with showers carry their water? Just like every other train the water is stored in tanks. Depending where in the world and the exact car manufacturer the tanks can be under the floor or near the roof. The way it has been done for over hundred years. 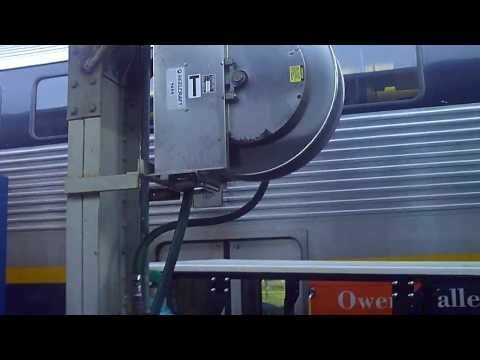 In most trains each car has their own water supply system. Water is heavy and costs money to haul around. Something factored into the higher prices they charge for trains with showers. NOT EVERY SLEEPING CAR has showers. Take your long relaxing shower at some other time. Others on the train would like some water leftover for their shower too. Other tanks hold the waste water. These tanks are filled and emptied at the longer stops as part of the servicing done at the stations. The process to fill the tanks is not very complicated. Trains without showers also carry tanks of water for the toilets and sinks. In tanks under the floor, then use pumps to bring it to the spigot/shower head.